I order a 15 pieces matryoshka. Received in time and very well packed. These Russian dolls are so beautiful … even more than on the website !!! This Matryoshka doll comes directly from Moscow. 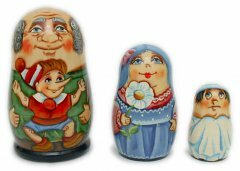 It contains 3 stackable figurines (nesting dolls) crafted of wood, skilfully hand painted and varnished with gloss finish. The dolls are signed by the artist. The dolls are all hollow except the smallest one, and can hide one inside another. The set depicts characters of the book The Golden Key, or the Adventures of Buratino (1936) by Aleksey Nikolayevich Tolstoy.